Former Newcastle midfielder Yohan Cabaye was sent off as defending champions Paris St-Germain failed to break down lowly Ligue 1 rivals Evian. Without their injured talisman Zlatan Ibrahimovic, PSG lacked attacking threat against the 18th-placed side. And they survived the dismissal of Cabaye, who was sent off in the 62nd minute for a second bookable offence. 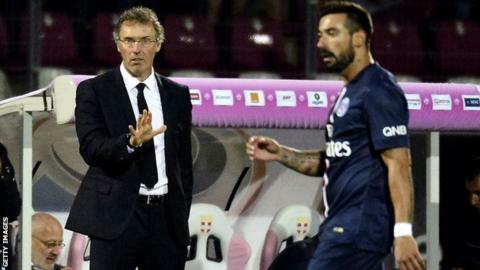 Laurent Blanc's men are now unbeaten after three games, but have only won once - the opener against Bastia. "I think that given the way the game went we didn't do enough to take three points," said former France captain Blanc. "We expected to have difficulties at the start of the season, especially in August, but I don't think there is any reason to worry." Match ends, Evian Thonon Gaillard 0, Paris Saint Germain 0. Second Half ends, Evian Thonon Gaillard 0, Paris Saint Germain 0. Olivier Sorlin (Evian Thonon Gaillard) wins a free kick in the defensive half. Attempt missed. Daniel Wass (Evian Thonon Gaillard) right footed shot from the centre of the box misses to the right. Assisted by Aldo Angoula with a headed pass following a corner. Corner, Evian Thonon Gaillard. Conceded by Marco Verratti. Attempt blocked. Jonathan Mensah (Evian Thonon Gaillard) right footed shot from outside the box is blocked. Attempt blocked. Jonathan Mensah (Evian Thonon Gaillard) left footed shot from the centre of the box is blocked. Attempt blocked. Aldo Angoula (Evian Thonon Gaillard) header from the centre of the box is blocked. Assisted by Daniel Wass with a cross. Corner, Evian Thonon Gaillard. Conceded by Salvatore Sirigu. Attempt saved. Nicolas Benezet (Evian Thonon Gaillard) right footed shot from outside the box is saved in the top left corner. Assisted by Daniel Wass. Offside, Evian Thonon Gaillard. Daniel Wass tries a through ball, but Nicolas Benezet is caught offside. Attempt missed. Cédric Barbosa (Evian Thonon Gaillard) right footed shot from a difficult angle and long range on the right is too high from a direct free kick. Hand ball by Lucas Digne (Paris Saint Germain). Corner, Evian Thonon Gaillard. Conceded by Serge Aurier. Attempt blocked. Nicolas Benezet (Evian Thonon Gaillard) right footed shot from outside the box is blocked. Assisted by Daniel Wass. Attempt missed. Lucas Digne (Paris Saint Germain) left footed shot from the left side of the box misses to the left. Assisted by Javier Pastore with a cross. Substitution, Evian Thonon Gaillard. Cédric Barbosa replaces Nicki Bille. Offside, Paris Saint Germain. Serge Aurier tries a through ball, but Ezequiel Lavezzi is caught offside. Foul by Nicolas Benezet (Evian Thonon Gaillard). Attempt missed. David Luiz (Paris Saint Germain) left footed shot from outside the box misses to the right. Assisted by Blaise Matuidi. Foul by Kassim Abdallah (Evian Thonon Gaillard). Marco Verratti (Paris Saint Germain) is shown the yellow card for hand ball. Serge Aurier (Paris Saint Germain) wins a free kick in the defensive half. Foul by Nicki Bille (Evian Thonon Gaillard). Substitution, Evian Thonon Gaillard. Nicolas Benezet replaces Clarck N'Sikulu. Offside, Paris Saint Germain. David Luiz tries a through ball, but Edinson Cavani is caught offside. Olivier Sorlin (Evian Thonon Gaillard) is shown the yellow card for a bad foul. Foul by Olivier Sorlin (Evian Thonon Gaillard). Attempt blocked. Nicki Bille (Evian Thonon Gaillard) right footed shot from the centre of the box is blocked. Assisted by Clarck N'Sikulu. Offside, Paris Saint Germain. David Luiz tries a through ball, but Lucas Moura is caught offside.